Today was market day. Twice a week, on Wednesdays and Saturdays, we go to the local Farmer’s Market to sell our fresh vegetables, fruits, jams, jellies, and such. Each market day is a little different, and you never know what might happen. Here’s a glimpse into how today went. We woke up to the alarm clock at 4:45. Joey was already up and going, and Elizabeth and I hurried to get dressed and do our morning routine. By 5:25, we were in the truck with aprons on (except Joey!) and ready to head to market. After a short 30 minute drive, we pulled into the town square at 6:00. We got our pop- up tent put up, and unloaded tables, boxes, veggies, canned goods, our signs, and all the things we need to make a market morning run smoothly. Then, Joey, Elizabeth and I started working as quickly as we could to get the vegetables sorted and set into boxes for display on our table. Around 6:30, the customers started to stop by. Elizabeth and I waited on folks while Joey kept boxing. The morning passed like a blur. It wasn’t unusual to have 4 or 5 people at our table waiting to buy veggies. We hurried to fill orders and answer questions. Many of the people that started out as customers have become old friends. It is such a joy to see them each week and catch up on what’s been going on in their lives. When we are especially busy and haven’t been able to get everything boxed and displayed, sometimes these wonderful people pitch in to fill their own orders! This morning, I found myself handing a peck basket of okra to one of my favorite customers and telling her to fill a box with what she needed. I jokingly told her it was pretty bad when she had to fill her own order! We both had a laugh about that! Our 6 year old daughter Elizabeth also helps with customers at the market and is learning how to make change this summer. She loves helping fill orders and working with the money. The folks that stop by our booth are so patient and encouraging to her. They always have a kind word or a joke to tell her. As I said earlier, you never know what will happen at the market, and today we got a big surprise. One of our sweet customers brought us a wonderful cookbook (which you all know I loved!) and a fabulous homemade soy candle! She just brought them because she knew we would love them. That really touched my heart. Another lovely lady thoughtfully brought us an envelope with seeds that she had carefully saved from the tomatoes she had bought from us the week before. It is such a blessing to be able to build relationships with the folks at market. We love helping them learn about canning and preserving, growing a garden, drying herbs, and saving seeds. It’s also a blessing to be able to learn things from our customers. We have heard so many great gardening tips, recipes, and household ideas. It’s also fun to visit with the other vendors that sell at the market. When we have a lull in the crowd, we like to slip over to another tent and spend a moment with some of the talented folks that bake, craft, and farm. We have a really nice group of folks that sell at the market. The market, like any business, has it’s busy and slow times. 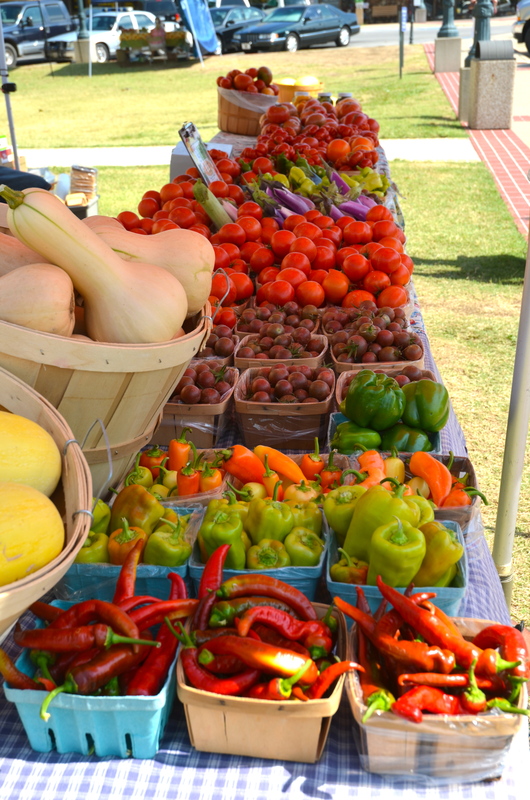 Of course, the end of July is a busy time with tomatoes, peppers, and all the summer veggies being in full swing. Today went by like a blur. We were sold out of vegetables and ready to load up by around 10:00. We packed the truck and headed home. I have to admit that sometimes when the alarm goes off at 4:45 on market day, I am reluctant to get out of bed. I think about how nice it would be to just sleep in and worry about those vegetables later. Of course, I never do, and by the time market is over for the day, I am so glad I didn’t. On the drive home from market, Joey and I are always so humbled and amazed at the wonderful people that we call our customers. Whether it’s seeing the look of delight on someones face when they spot their favorite kind of tomato, or being able to share with someone how easy it is to can green beans, or getting to hear a cherished memory of someones life on the farm, market day is so rewarding. I know I say it all the time, but I am so grateful that Joey and I are able to live on his family’s farm. I am thankful for the market, for the wonderful people we meet, and for all the blessings that make up our life on the farm. Market comes around every Wednesday and every Saturday. Stop by and see us and get your own special glimpse of market day. Here is a picture I took last year of our Market Day table. 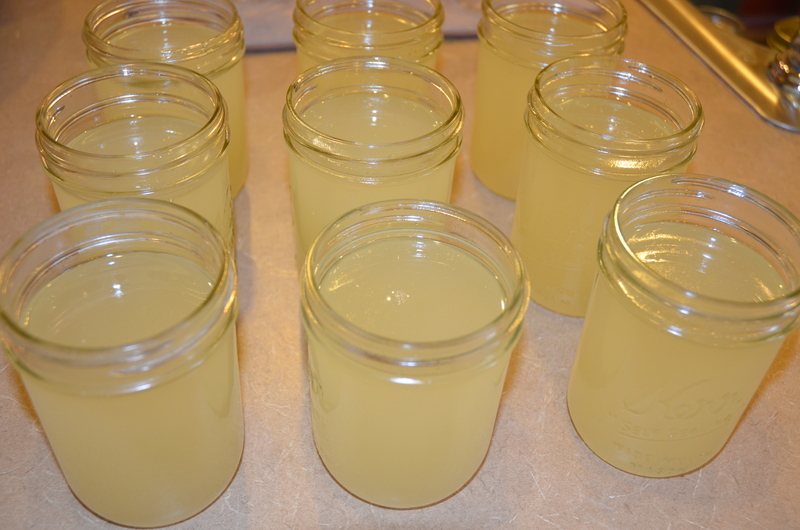 I rendered lard for the first time this summer. It all started when my wonderful friend Rachel of Jersey Knoll Farms offered me a bag of fresh pork fat. At first, I was hesitant to accept. I had visions of spending hours over a huge cast iron kettle full of hot popping oil. 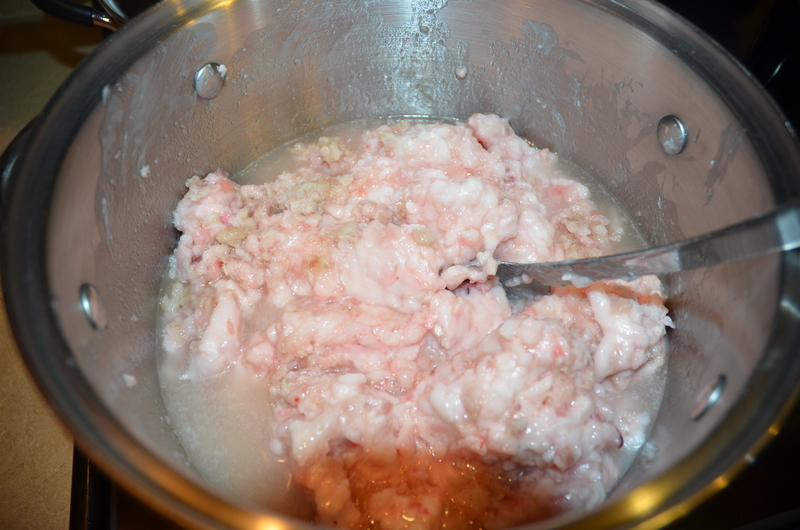 Fortunately, after a short talk with Rachel, I learned that rendering lard is easy, fairly quick, and (I think) fun! Here’s how I did it. (At this point, I have to throw in my standard disclaimer. If you render lard, or think about rendering lard, and something goes horribly wrong, I am not responsible.) 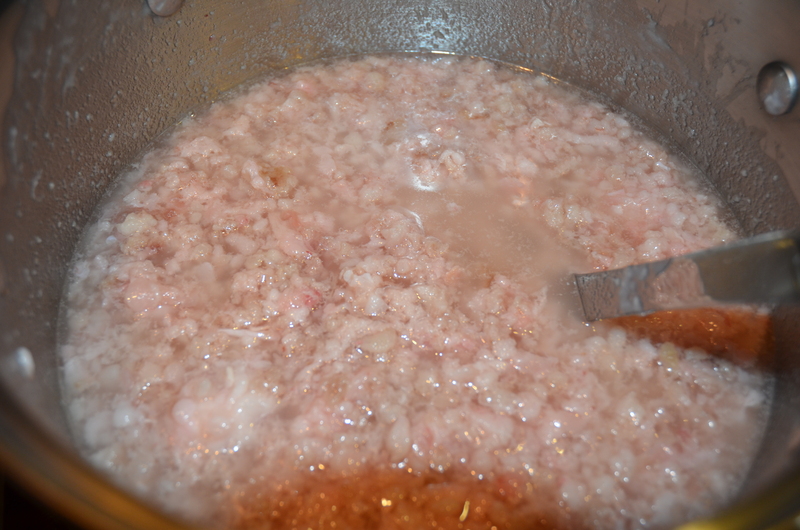 Also, if pictures of pork fat bother you, you may not want to read this post. 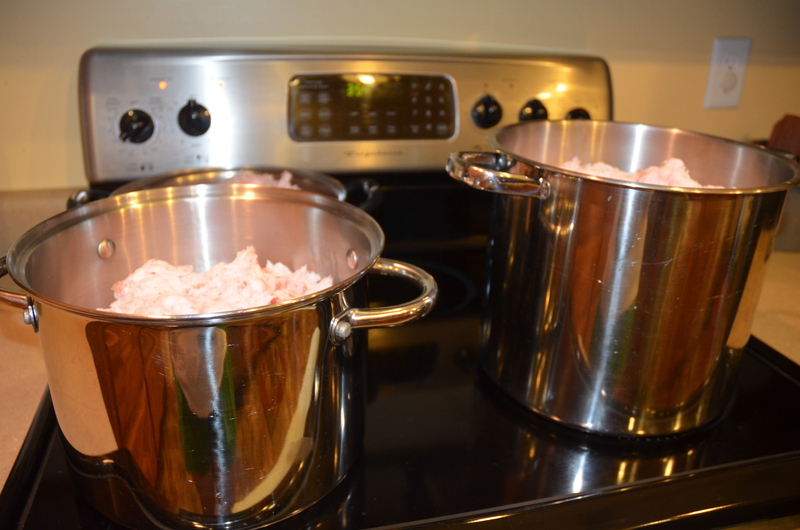 First, I placed the fat into my stainless steel cooking pots. I turned the stove on very low heat. Here is a close up of what the fat looked like before I turned the stove on. The next steps were very easy. Keeping the heat on low, I just let the fat slowly start to melt. Every few minutes, I gave it a stir to make sure it wasn’t sticking or burning on the bottom of the pan. You can see it is starting to turn to a liquid in this photo. It cooked a little longer, melted a little more, and it looked like this. Annnd…..I cooked it a little bit longer, it melted a little bit more, and it looked like this. You can see that by this point, the pieces that are left are pretty small. 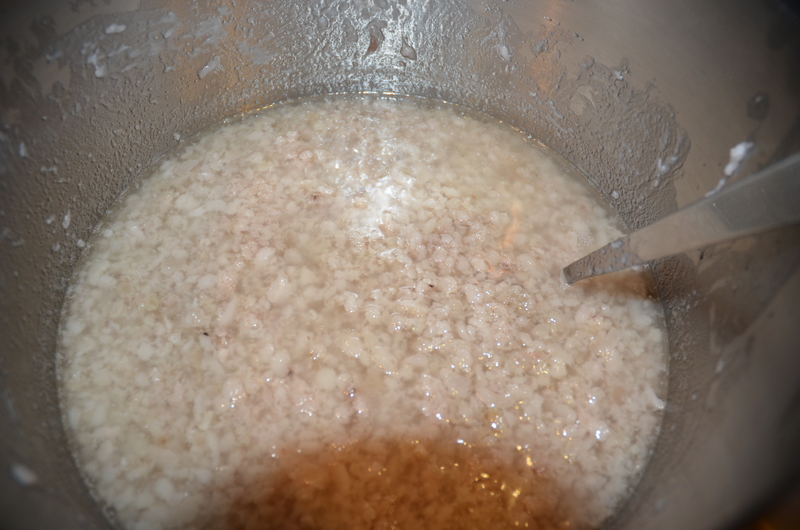 At this stage, I could have kept cooking it down, but I since I wanted to have bright, white, clean-tasting lard, I decided to stop and drain off the liquid. Here is my set up for draining off the liquid. 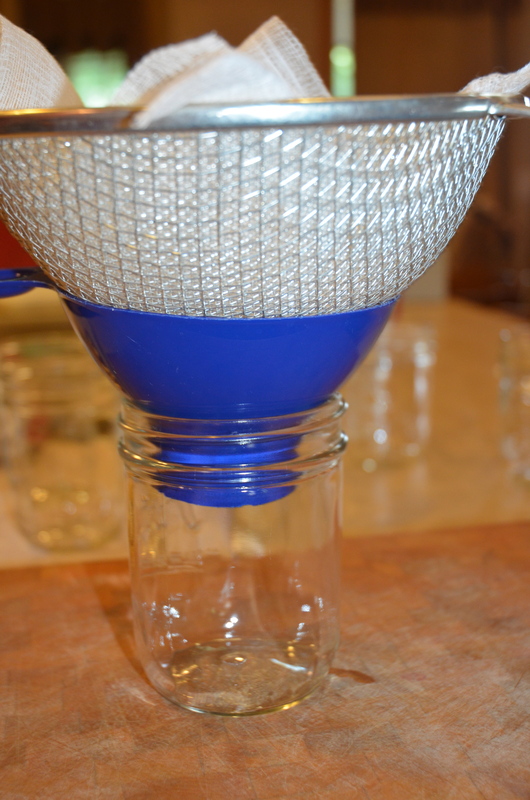 I used a canning funnel and a wire strainer that I lined with cheesecloth. By doing this, I was able to pour the liquid directly in the jar. When I first poured the liquid in, it was a yellowish color. But, when it was completely cool, the lard was a beautiful, pure, white! In all, the whole process took me around two hours. After the lard cooled completely, I put it in the refrigerator for storage. 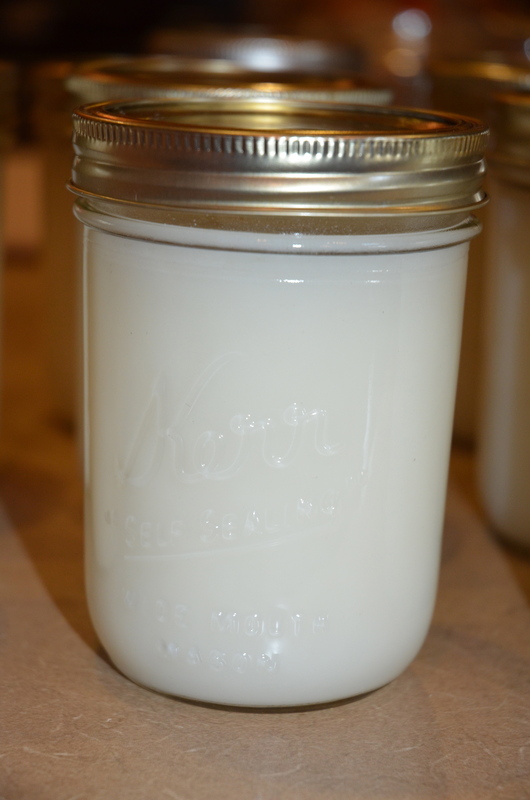 I have really enjoyed cooking with lard. We fried okra and new potatoes in it, and I am looking forward to using it to make a pie crust for a blackberry pie! The best thing is that I know I am using a product from an animal that was properly cared for, fed good food, and raised on a local farm. It is so important to know where your food comes from. 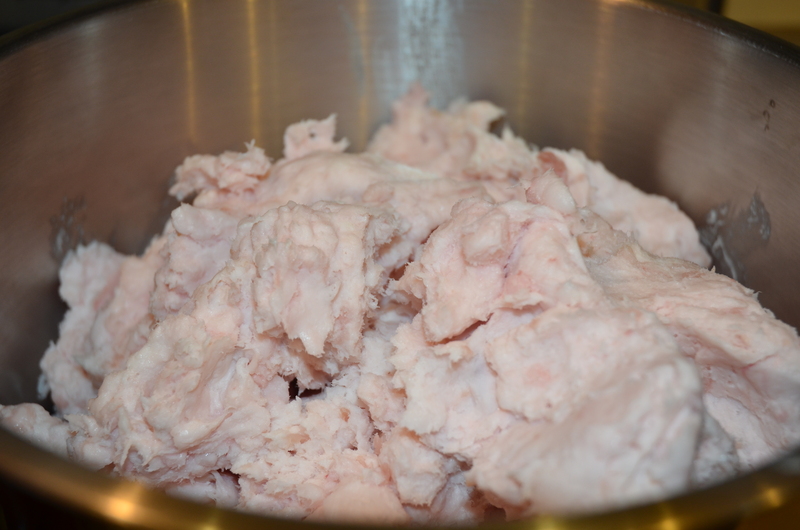 Rendering my own lard with locally grown pork is one way I can do just that.